YES 2 RENEWABLES has been established by Friends of the Earth to engage the community on proposed renewable energy projects. Some of the standard myths around renewables are considered, and details on current, "live" debates about emerging projects are provided. Over time, the intention is to include details on proposals going through the approvals process, how to provide submissions and input, and details on legitimate concerns which may need to inform the planning process. 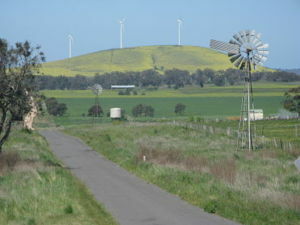 It seems that while the forces opposed to wind farm developments are well organised and vocal, the majority of Victorians who support good and well planned projects are not. We believe that there is a real desire in the community to find ways to support well planned and appropriate renewable projects. any additional links/ groups/ policy that would be useful to include. This page was last modified 01:28, 29 October 2010.